US M4 Sherman medium tank series with 75mm gun of WW2. A posed picture of a Sherman of the US Army with infantry fighting from the tank. Infantry fought only rarely from tanks. Usually they followed it and used it as a shield. Only the Red Army made an exception. Type: US medium army tank. Development of the medium tank M3 Lee/Grant were definitely carried out as an advancement of the M2A1 on the distinct awareness that it was to be regarded as a temporary development to have a tank with 75mm gun armament into manufacturing and operation as soon as practical. While development had been undertaken on the M3 the Armored Force Board drafted specifications for its successor having a 75mm gun inside a 100% traversing turret. Ultimate M3 working blueprints were finished in March 1941, and Rock Island Arsenal provided the Armored Force Board 5 recommended plans for the M4 Sherman at a conference the subsequent month. Probably the most uncomplicated design had been picked, which required utilizing the M3 medium chassis, transmission, power unit, suspension, and some other mechanical components, unaffected, as well as featuring an entirely fresh hull top, both welded or cast, having a central turret mounting the 75mm gun. The 37mm gun had been rejected and a machine gun cupola ended up being to maintained on the fresh turret. Doors had been created in every side of the hull as in the M3 Lee. 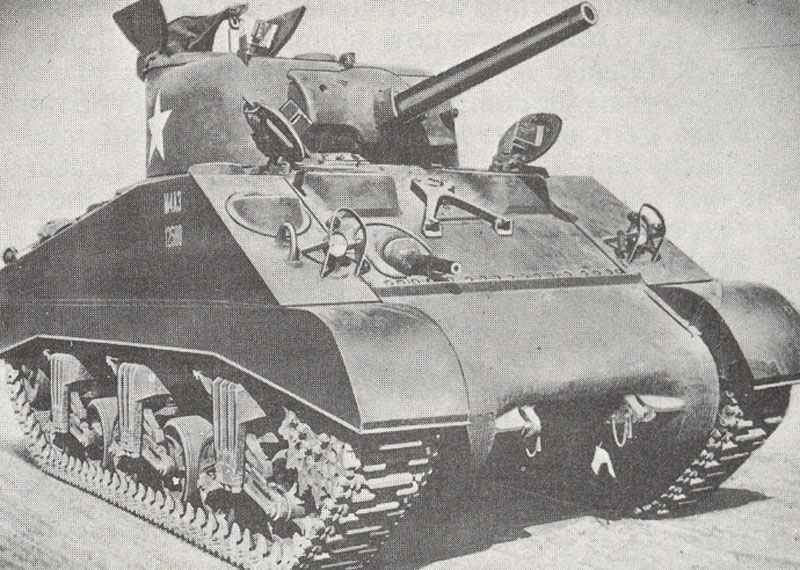 Named Medium Tank T6, this tank was assembled in wooden mock-up kind in May 1941 for Armored Force Board authorization, together with a pilot design, with cast hull and minor modifications including removal of the cupola, was finalized at Aberdeen Proving Ground on 19th September 1941. It’s luring to point out that the T6 had been inspired, or even cloned somewhat, from the Canadian Ram in view of its similarity. Documented facts (as well as the chronology of events) disprove this, on the other hand. An early manufacturing Ram had been delivered from Montreal Locomotive works in July 1941 for tests at Aberdeen Proving Ground which continued until October that year, but APG’s record about the Ram was interested just with its compatibility to the M3 Lee and featured not any remark on its significance to the T6 development. At the same time the German Operation Barbarossa against the Soviet Union in June 1941 revealed that possibility of US participation in WW2 in Europe might rise during the following 12 months. On President Roosevelt’s personal requests tank manufacturing schedules for 1942, provisionally fixed at One Thousand medium tanks per month, had been doubled. For this purpose, further plants were necessary and Pacific Car & Foundry, Fisher, Ford, and Federal Machine & Welder had been included to the number of factories arranged to produce the latest medium tank. In October 1941, the T6 became standard as the Medium Tank M4 and blueprints were created to release the M4 Sherman on to the manufacturing line, in these factories producing M3 Lees, at several practical time at the beginning of 1942. This implies that M4 medium vehicles would be assembled at a whole of Eleven factories during 1942. A primary suggestion was that a subsequent purpose-built tank manufacturing factory be constructed at the production lines of Detroit Arsenal. In September 1941 Fisher had been instructed to assemble and manage this plant at Grand Blanc, Michigan. Constructing of Grand Blanc Tank Arsenal, created right away to produce M4s, had been began in January 1942 and tank manufacturing started the next July, however Fisher had, present, started manufacturing M4s in one of the present factories. The M4 Sherman pilot unit was assembled by Lima Locomotive works in February 1942 varying from the T6 mainly in the removal of the hull side doors. Total manufacturing in 3 factories, Lima, Pressed Steel, and Pacific Car & Foundry began the next month, every one of these original manufacturing models being cast hull tanks, named M4A1. From the fall of 1942 all the other factories within the programme had been entirely in manufacturing, and in October 1942, during Second Alamein, the initial M4 medium tanks went into battle with the British 8th Army. 3d model of M4A3 Sherman tank. M4 Sherman tanks in manoeuvres in the American desert. Shermans leaving a landing ship. The censor’s marks the original contact print of this shot reveals the 1st Armd.Div. rhino above the unit serial ’71’ on the nearest trackguard – identifying a British Sherman II of HQ, 2nd Armd.Bde during the battle of Alamein. Shermans of the Red Army near Kharkov, 1943. Note the extra fuel tanks at the back of the hull. A captured M4 Sherman in use by the German Wehrmacht. A Sherman tank of the RAC Tank Museum, Bovington Camp, Dorset (UK). American M4 Sherman tank to stop the German advance through the Ardennes. GIs from the 7th Armored Division take a watchful rest in the streets of St Vith during their retreat. They are covered by a white-washed M4 Sherman tank. M4 Sherman medium tank giving a ride to GIs. American Sherman tanks firing on the Gothic Line. An US M4 Sherman tank follows the path blasted by Engineers through the Siegfried Line at Aachen. ront view of an M4 Sherman battle tank of the French Expeditionary Corps. Sherman tanks of the British 8th Army in August in Italy on the rise to the north. French FFA members bring in German prisoners in front of a M4 Sherman tank the 2nd French Armored Division. British troops move forward on the back of a M4 Sherman tank during their attempt to reach the airborne forces in Holland. The M4 Sherman line had been by far the most largely manufactured, most commonly used, as well as most essential of all the tanks operating by US, British, as well as other allied armies in WW2. Although it is not really the most efficient Allied tank in qualitative conditions, and definitely unfavorable in hitting power as well as armour to the top German and Soviet medium tanks – like the Panzer V Panther or T-34 tank – the M4 medium tank (commonly regarded by its English name of M4 Sherman) enjoyed the benefits of usability of servicing, stability, speed, ruggedness, as well as a simple layout. The firepower of the T-34-76 and the M4 Sherman is considered similar on the earlier version because the Russian 76mm gun on the T-34-76 was similar to the 75mm Sherman gun. These were most essential aspects for a tank being mass-produced in commercial factories without any qualifications of army knowledge in peace-time, in order to use usually by conscript soldiers with instruction hours restricted by the requirements of warfare. When it comes to cost versus efficiency, the M4 Sherman had been quite fitted to the requirements of the time, a truth indicated in the overall production of in excess of 40,000 vehicles (and related AFVs) while using M4 chassis within the years 1942-1946. Sherman tanks were in action by every allied army in almost every armour purpose on every battling front. The Medium Tank M4 enjoyed the identical standard chassis as the M3 Lee medium tank, with suspension, vertical volute, front drive, and rear engine. Besides very earlier types, the bogies had been modified, nevertheless, in order that the return rollers had been fixed behind, rather than on top of, the spring units. Hull had been either cast, welded, or welded with cast/rolled nose, while the 75mm gun was placed in an uncomplicated cast turret and featured with a gyro-stabiliser like in the M3 Lee. At first the powerplant was a Continental R-975 air-cooled radial engine, but an ever-­persistent lack of this specific Wright-built power system (which was primarily a plane powerplant and required therefore by the aero industry) pressured the usage of other engines, giving increase of the major manufacturing versions. The M4 Sherman had a 5-man crew, could fire AP or HE shells, had a top armour thickness of 50mm (more on altered and later types) got controlled differential steering, weighed from 33 (short) tons, gross, and had a best speed of 24-30 mph depending on version. There have been a lot of detail modifications and enhancements in Sherman types throughout their manufacturing time. Users: US, Britain, Russia, Free-French and most other Allied forces. 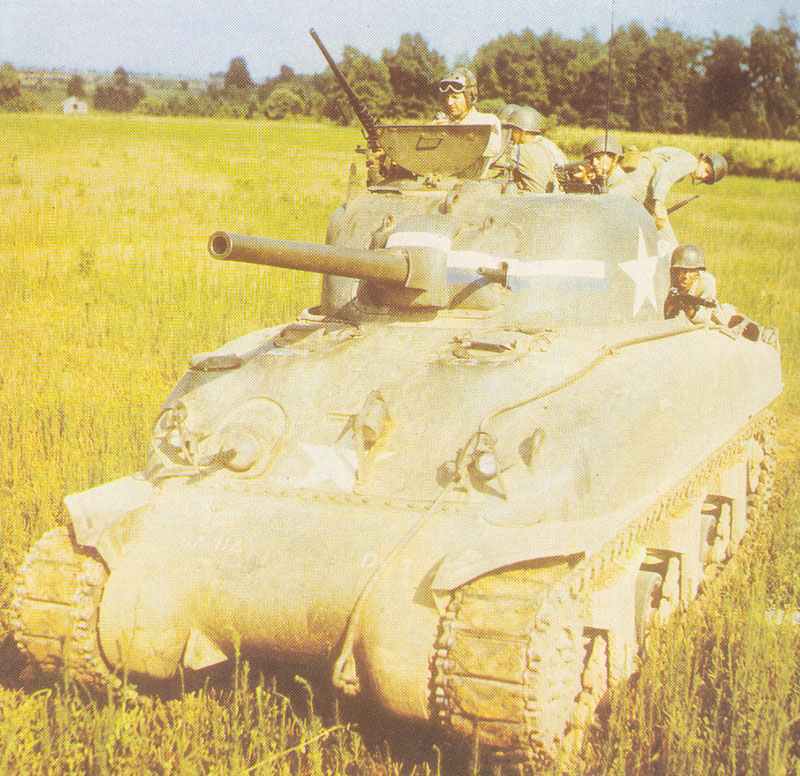 Standard production M4A3 Sherman (Ford-Built). 5th model in manufacturing, this specific type had a welded hull and was equipped with a 500 hp Ford GAA V-8 gasoline powerplant special created for this tank. This became the manufacturing model most preferred by the US Army and the majority of these had been preserved for US use, Lend-Lease deliveries being primarily focused on other versions. Manufacturing adjustments as for M4 besides that this design had the one-piece cast nose for its entire manufacturing time. Ford built 1,690 M4A3s from June 1942 until September 1943 before stopping Sherman output for some other munitions work. M4A3 manufacturing was then adopted by Grand Blanc from February 1944-March 1945, and various superior characteristics were designed, such as a vision cupola for the commander, 47° hull front, a loader’s hatch, and ‘wet stowage’ for the ammo. This became by far the most innovative M4 series tank with 75mm gun, the innovations being in range with those in up-gunned 76-mm Sherman variants discussed here. Total production of improved M4A3: 3,071. Turret of M4A3 (details unknown) 15-75 ? Hull of M4A3 (details unknown) 12-50 ? Tagged 1942, medium tank, sherman, usa.